two peas & the dog: food. 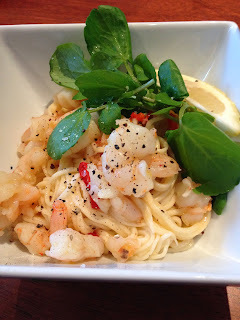 chilli, lemon and prawn pasta. food. chilli, lemon and prawn pasta. down here than in the States so I really have to stick to the 'yes Nate, I'll make at least one recipe from this magazine' idea. Donna Hay is easily becoming a go-to for my recipes (I only have two magazines but they are GOOD!). I was a bit thrown off by the spaghetti noodles at first, but this dish turned out great! We'll be adding it to our menu rotation. Cook the pasta in a large saucepan of salted boiling water. If you're using store-bought pasta, cook for 8-10 minutes. If you're using fresh-made pasta, cook 4-6 minutes. Drain, reserving 1/2 cup of the cooking water. Heat a medium fry pan on high heat. Add the 40g unsalted butter, 1 Tbls extra virgin olive oil, 4 cloves of garlic (through a garlic press) and 1 sliced chilli and cook, stirring for 2-3 minutes. Add the 1 Tbls lemon zest, prawns, salt and pepper and cook for another 3-5 minutes until the prawns are cooked through. Add the pasta and the reserved 1/2 cup water, toss to combine. Serve with watercress. Next time I may add another chilli for more heat. I think the prawns part of this dish would be great in a cold roll - something we'll try on the next hot day!